This brush applicator system provides instant all-purpose Crazy Glue. It gives excellent surface coverage while the brush stays fresh in a no-clog bottle. It-Feet's great for hard to reach surfaces and bonds wood, metal, ceramics, pottery, rubber, vinyl, leather, and plastic, forming a strong long-lasting bond on most surfaces. Warning: it is an eye irritant and should be kept out of reach of children. This bottle contains .18 ounces.. 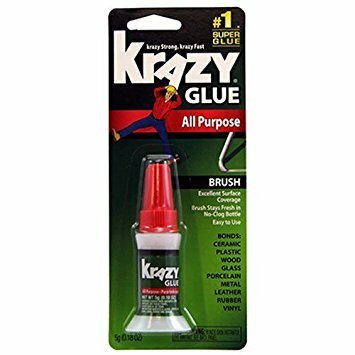 If you have any questions about this product by Krazy Glue K, contact us by completing and submitting the form below. If you are looking for a specif part number, please include it with your message. GEOCEL CAULK & SEALANTS 290427 2300 Construction Tripolymer Sealant, Black, 10.3 Oz. Starbond KE-150 Black Medium, PREMIUM Rubber Toughened CA - Super Glue plus Extra Cap and Microtips, 2 oz.